Hello my beautiful moonlight, welcome to Fitness Friday and my end of week 6 progress update. I can’t believe I am half way there! These 6 weeks have flown by so fast and many things have changed in these past 6 weeks both physically and mentally. Fitness Friday – Week 6 to 8 Progress Update and Why haven’t I been posting? Hi my lovely buttercups, welcome back to my Fitness Friday progress update. I apologize for not been updating you guys on my progress the last couple of weeks. Honestly, I think I got a little insecure about my progress these past few weeks, I feel like I don’t have much to show you guys. I am kind of disappointed in myself and getting discouraged. From some of the progress pictures, I feel like I look bigger than the week before. I lost that immediately gratification of the first few weeks and I don’t know what to do to get out of that rut emotionally. Then this week I started to ask myself what is the end goal of this fitness challenge? And I think this helps me get back on track mentally. 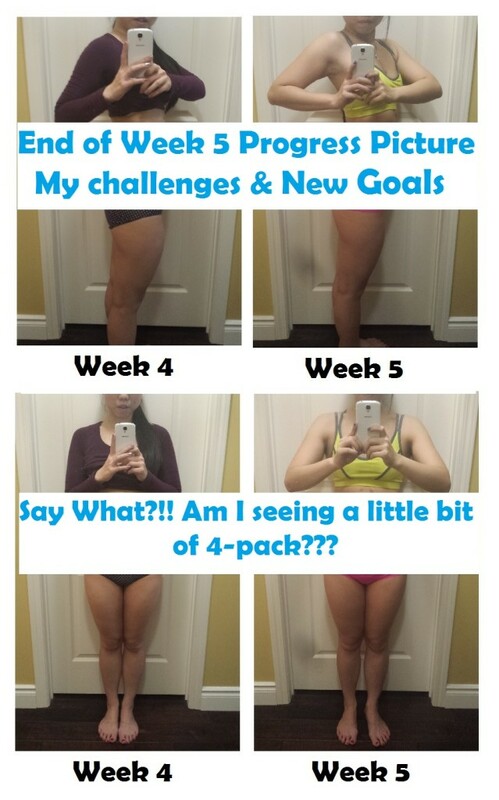 Fitness Friday – End of Week 5 Progress Update & Sharing my Challenges and New Goals!!! Hello my Sparkles!!! Welcome to Fitness Friday end of Week 5 progress update! How is everybody doing this week? Have you been following your workout routine? Have you been eating well and fuel your body with nutritious food? These are the questions that I ask myself almost everyday. I am starting to have a deeper understanding of this 12 week challenge. It is no longer about having that 6-pack for the summer even though it could be the positive spillover of it but this journey is all about creating that healthy habit and discipline through exercising and eating right for life. Hi my fabulous friends!! Welcome to Fitness Friday and the first day of Spring. It is just so fantastic knowing Spring is finally here. I can’t wait to take the kids outside and breathe some warm fresh air. On a side note, my twins have never been to a playground (they were in the stroller last year because they can’t walk) but this year they will be out and about trying everything. I can’t wait to see how they interact with other kids and Princess A.
Hi my beautiful sunshine! Welcome to week 3 of Fitness Friday. Are you guys as excited as I am? The weather is finally getting warmer, I can’t wait to do some outdoor exercises. Honestly Canadian weather is way too long. Tell me what your favourite outdoor activities are in the comment down below or on my GlitterMommy Facebook Page. This spring/summer let’s inspire each other to be active. Hi my fabulous friends, Fitness Friday is back!!! I am so super excited and pumped to start this series again. In the past month and a half, our family have been through a lot. First, I got pneumonia the week after I started Fitness Friday then another family health matter came up which required all of our concentration hence all my blogging came to a halt. This week I finally feel I am physically and mentally ready for this challenge again. Hello my gorgeous friends, I will be introducing a series on my blog called Fitness Friday. This is a 12 weeks series that documents my body transformation (in a positive way hopefully) through different workout programs that I follow.